Today was Ma’s birthday. It’s the first birthday party she ever missed. What do you do when one of the most important people in your life is no longer there? Nobody seemed to know. So we muddled on, as Smith Boys do. Dad and I went in the craft store to get her some silk roses (she loved roses) while the brothers hung out at the tractor store next to it. (“They are politically unacceptable,” Brother the Younger said of the craft store. “They have better flowers,” Dad said. I remained Switzerland, although I suspect the tractor store guys aren’t Pelosi liberals either.) It was funny walking from one to the next. From the “Paris Flea Market” faux signs and dueling perfumes in the mostly women’s store to the John Deere hats and reassuring manure smell of the tractor joint. It felt like home. Except maybe for the camel in the parking lot. We went together to the cemetery wedged between the cotton fields, our little tribe. Dad put down the new flowers on the grave, which still doesn’t look quite like it belongs there. A little too new, a little too sad. But a couple of tiny purple flowers decorated the mostly barren dirt (water shortage, you know), miniature reminders of life’s precious seasons. She would have been 81 today, Dad said, breaking the silence after a while. She loved birthday cake, I offered. Never bring me in for a eulogy. We stood quietly for a long time, each left to our memories. I thought about how many birthdays I missed, how many times I didn’t call till 10 p.m. between deadlines, how she must have been waiting by the phone all day. I’m sorry, Ma. I thought about the copy of “War and Peace” next to “Saloons of the Old West” in the garage. Of how I would give anything just to hear her say “Rare Bear” one more time. Then Dad said I guess we can go, so we did. Brother the Younger took the long way around town. We ate pizza for lunch, and he wouldn’t let me drive the bumper cars, even though I assured him Ma would have wanted me to. So much for our new birthday tradition. And then it was a day pretty much like any other day. Except she wasn’t here to share it. 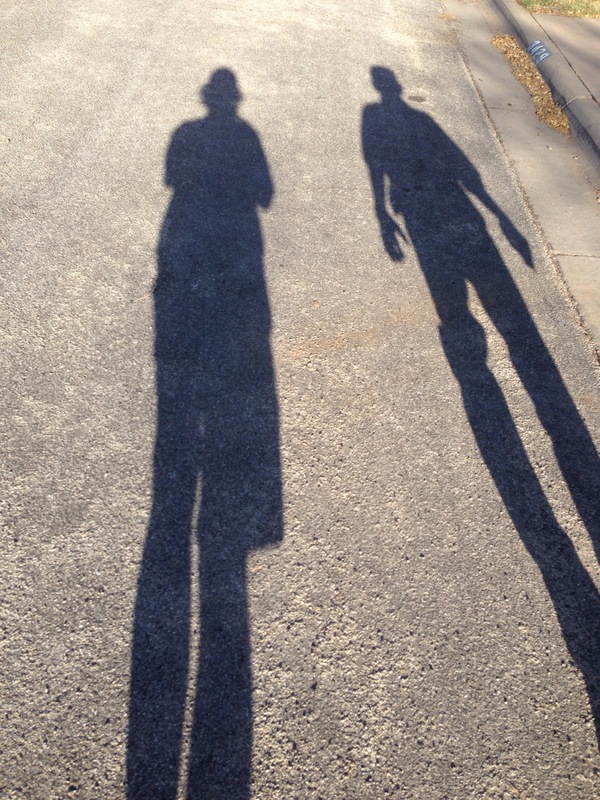 Dad and I went for our evening walk, and the shadows were long companions walking ahead of us. It made me think: Maybe that’s Ma these days. She’s always a shadow, looking over us, sometimes in front, sometimes behind. Always there. All you have to do is notice. She’s gone, but not so much. She’ll always be around, even on cloudy days. Because that’s what a mother does. happy birthday Maw. happy birthday. i bet you thought we would forget. …I have Nanny’s little white mixer. I knew you would love that. i wasn’t ready…. i wish you were here. we are working on plan E. A,B,C…D didn’t work. we don’t watch soap operas anymore… we reach for the phone.. and try to find a place to call. hurricanes better not come. our rock is gone. we did not forget your birthday. yes. we still love you. thank you. for being you. It’s my first borns birthday today and I know how much she loved you. How she understood that a call, no matter when it came, was precious and how very proud she was to have raised good men. thanks, ceej. You’re a pretty great mom yourself. I found your blog thanks to Rick Smith. Now I figure it will take me months to read it all. It is great! I am enjoying it and remember my years running with the Road Lizards. Good job! thanks, Rita! I was a Road Lizard about 30 years ago, so it was a pleasant surprise to come back this year and find the group is still going strong. Good folks. Do you remember my uncle Monty Montgomery? He one of the older runners. He came to visit one day and told me I should start running. After he and Bernice left, I decided to run from my house down to the road. (about 1/32nd of a mile) I came home and fell on the sofa and thought I would die. After that I started running every day, it took me a year before I could run a mile without stopping. I managed to go every day for just under 10 years without missing a day. I was in the Road Lizards for about 22 years.I loved it. Now I just go to the fitness center and ‘walk’ fast on the tread mill for 40 minutes every day. Your blog is great! I will e-mail Rick Smith and tell him thanks. I don’t think I ever met him, but I remember the award! I’ve got a road lizard carved by Tom similar to the award that’s among my most treasured possessions. I’m glad you’re still going strong. Forty minutes on the TM is a great workout! Nothing like starting my day with a good bawl. You two are awesome and horrible and I miss you.